Although there are a number of ways to print photos from your Lumia Windows phone, the new PhotoMart app is one of the only ways to print your photos at Walmart directly from your smartphone. In fact, PhotoMart is exclusively available for Microsoft's Lumia phones, the company said. "Choose your print size (4×6, 5×7, 8×10, 4×4, 5×5 or 8×8), pick the photos you want to print from your Camera Roll and then head to the nearest Walmart to pick up your prints in an hour," Microsoft blogger Athima Chansanchai wrote. "You’ll even get turn-by-turn directions to the store. Or, you can order prints while you’re shopping there. You’ll also be able to crop your photos and apply simple filters from the app." For those who live in rural areas where Walmart (for better or for worse) represents the only major grocery store, the ability to print a photo while you shop might be useful. 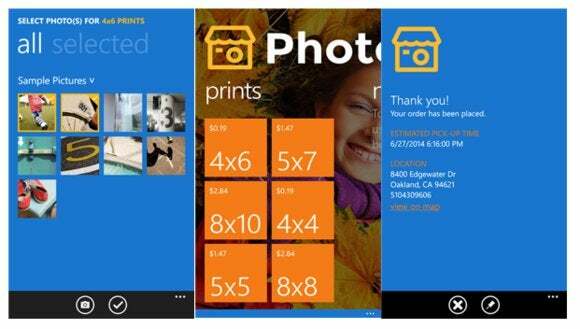 There are other options, however: Walgreens has published a Windows Phone app (and Printicular provides an alternative), while FreePrints allows you to send away for free 4x6 photos. The SmileBooks app provides another choice for printing services. Granted, photos taken with a Lumia phone should be backed up to OneDrive, where they can be downloaded to a PC and then transferred to the Web app of your choice. Still, it's an extra step that the PhotoMart app will save you.